Reduce your risk of fraud and chargebacks by adding an additional layer of authentication that protects you from liability for fraudulent card payments. Learn more about 3D Secure. 1) Not enabled. This means that we do not present the 3D Secure authentication process at all. If a card processor requires 3D Secure to authorize the payment, it will be declined automatically. 2) Enabled (default). This means that if a customer attempts to pay with a card that is enrolled in the 3D secure program they will be presented with an extra screen after entering their payment information to verify that they are the cardholder. If the card is not enrolled in the 3D secure program, the screen is not shown and the card is authorized or declined as normal. 3) Required. This means that all gift card transactions must be 3D Secure authorized and therefore the fraud liability has shifted to the card holder's bank. 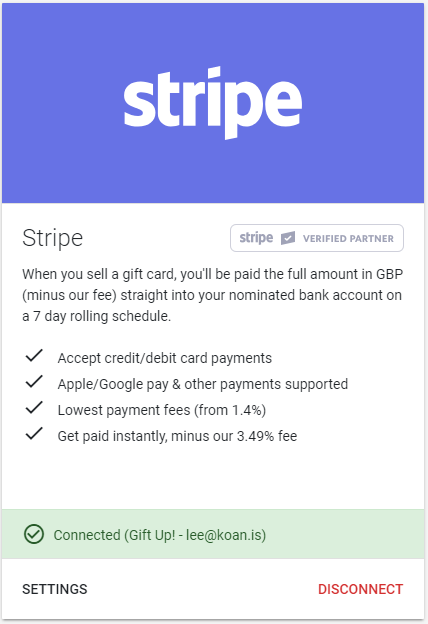 To change the setting, go to Integrations and click "Settings" on the Stripe card.